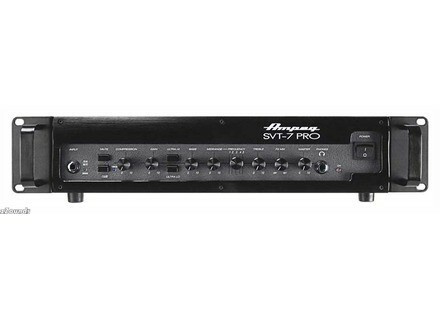 SVT-7 Pro, Bass Guitar Amp Head from Ampeg in the SVT Pro series. Ampeg announced two new heads within the SVT-PRO Series: Both new heads (SVT-7PRO, SVT-8PRO) deliver "high wattage, tonal flexibility and lightweight design" in rack-mountable units. The SVT-7PRO pumps out a kilowatt of Ampeg tone in a design that weighs in at 15lbs. The SVT-7PRO offers a flexible 5-position mid tone control, remote switching FX loop and an onboard variable compressor. The tube preamp boasts a premium JJ 12AX7 that feeds the weight-defying Class-D power section. The SVT-8PRO is designed to deliver up to 2500W of RMS power in a compact, lightweight design. The all-tube preamp, Class-D power section and classic Ampeg tone controls are designed to "create a compact powerhouse that fits in two rack spaces without sacrificing one bit of legendary Ampeg tone," the company says. The Ampeg SVT-7PRO is now available globally and has a U.S. MSRP of $1119.99, a list price of € 799 and is £816 including VAT. The SVT-8PRO has estimated availability in Q3, 2010 and will have a U.S. MSRP of $3359.99, a list price of € 2299 and is £2349 including VAT. You can see these and other exciting new Ampeg products at Musikmesse 2010 in Hall 6.1, Booth C31. Check out www.ampeg.com for more info. [Musikmesse] Ampeg Pro Neo Series Ampeg announced a new line of bass enclosures designed to handle the power of high-output, modern bass heads. [Musikmesse] Ampeg Heritage Series Ampeg announced a new line of heads and cabs designed and assembled in the U.S.A.
Warwick Robert Trujillo Signature Bass Trujillo is best known as a finger-style bass monster who played the bass for Suicidal Tendencies, Infectious Grooves, Ozzy Osbourne and Metallica since the late '80's.